It’s 20 below and the only thing that seems to sustain me through these long, dark, frigid days of winter is a warm, nourishing soup. 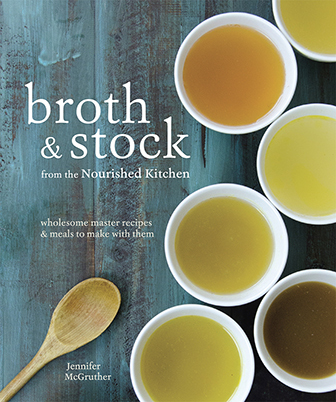 While broths and thin soups serve a purpose – as an appetizer or beginning to a meal – nothing truly satisfies like a dense, full-bodied soup overflowing with flavorful ingredients: herbs, vegetables and beans. When prepared properly, a good soup fulfills not only the sense, but also the body. A homemade stock prepared from bones and aromatic vegetables provides trace minerals as well as glucosamine chondroitin, while squash and Swiss chard provide a hefty dose of vitamins – particularly vitamin A. Moreover, this winter minestrone provides a healthy dose of wholesome fats: aromatic vegetables are gently fried in pasture-raised lard which is a potent source of vitamin D which is a particularly important nutrient for the dark days of winter while the soup is served with a dose of fruity, unrefined olive oil at the very end providing antioxidants and vitamin E.
Overflowing with vegetables and brimming with nourishing, wholesome fats, this winter minestrone makes for a nourishing, nutrient-dense supper during the darkest days of the year. The day before you plan to serve the soup, begin the soup by completely submerging cannellini beans in very warm water combined with 1 tablespoon cider vinegar. Cover the beans, water and vinegar and place them in a warm spot in your kitchen to soak for approximately twenty-four hours. After the beans have soaked for one day, drain them, rinse them and boil them in water until they’re tender and soft. After they’re thoroughly cooked and tender, about 60 to 90 minutes, remove them from heat drain them, rinse them and set aside. Boil the brown rice pasta until tender, but somewhat firm. Set aside to reserve. Heat lard, bacon fat or ghee in a heavy-bottomed pot over a medium-high flame until melted and sizzling. Add chopped onion and fry until fragrant and translucent. Add minced garlic, chopped carrots, chopped celery and cubed butternut squash frying with the onion until fragrant. Stir the dried basil and oregano into the mixture of vegetables. Pour two quarts homemade stock into the pot, taking care to scrape the pot with a metal spatula to dislodge any flavorful bits of vegetables that may be stuck to its bottom. Stir in crushed or pureed tomatoes. In summertime, my family roasts and freezes cases of heirloom tomatoes and I suggest you do the same. Freezing retains more nutrients than canning, and avoids the risks associated with BPA, a plasticizer with endocrine-disrupting effects. Simmer the broth, pureed tomatoes and vegetables together for thirty minutes or so. Remove the minestrone soup from heat, stir in the cooked cannellini beans, cooked pasta and sliced Swiss chard. Generously season the soup with unrefined sea salt to taste. Cover the minestrone and allow it to sit, removed from heat, for approximately five to ten minutes which allows the flavors to meld and the Swiss chard to wilt slightly. Serve with chopped fresh Italian flat leaf parsley, unrefined extra virgin olive oil and parmesan cheese. I like this! We are allergic to beans so I suppose I could just leave those out. The pasta too, we are grain-free right now. But for us it could be a good vegetable soup!! Hmm…. Thanks! Interesting to think about all the trace minerals this soup can provide with the fresh stock and potent ingredients. I was just reading this article about trace minerals that details all of them, like zinc, iron, iodine, etc., and was surprised how important these are to thyroid health and general wellness. Thanks for the recipe! This soup looks so good I wish I had a bowl sitting before me, already made. You mentioned that you freeze tomatoes because this retains more of the nutrients than canning, but how does freezing comapare to dehydrating the food in an Excalibur dehydrator on a “living foods” temperature? I plan to do this with my garden in the summer because freezer space is limited. Thanks for your wonderful blog and all the informative ideas and recipes you share with us. Have a wonderful day. Sounds awesome. I can’t wait to try it. though I’ll think I’ll pass on the lard. I’m glad you like the winter minestrone soup recipe! It’s my understanding that dehdydrating will preserve more nutrients – particularly food enzymes depending on the temperature at which you dehydrate it; however, since the tomato will ultimately be cooked I think that any difference is a moot point. We use our dehydrator a ton! One of my favorite things we made was dehydrated tomato puree – which is like a tomato fruit roll-up and great as a wrap for cheese and veggies. Do you avoid lard for religious purposes or just personal preference? We love it in our kitchen – particularly if it’s been freshly rendered. It’s one of the most potent food sources of vitamin D, something we can’t seem to get enough of in winter months. Thanks for commenting! I’ve enjoyed seeing you pop in at Nourished Kitchen. Love this recipe, in fact I will make it tonight. Just one question, why do you use lard/bacon fat instead of olive oil? Thanks for the question about my winter minestrone soup recipe! I prefer not to cook with olive oil, because heat destroys many of its components, reducing its vitamin E content and its antioxidant capacity. That said, it is primarily a mono-unsaturated fat so moderate application of heat is okay for olive oil – I just prefer a different method. Since this is a winter soup, I used pasture-raised lard which is a very concentrated source of vitamin D – a nutrient that’s difficult to come by in the dark days of winter. Sounds and looks wonderful! What about quinoa/corn pasta? Or just using brown/wild rice? Thanks!! We all really enjoyed this recipe, though with the addition of a nitrate free bacon bone. Most minestrones seem to miss something for me… i think this recipe has the right amount of dried herbs. The olive oil, parmesan and parsley go well on top also. Thanks for this- it is supposed to be a high of 19 (F) tomorrow – perfect! As a side note…. Planning on throwing the pasta in (uncooked) close to the end of the cooking time of the soup- one less pot/step! thanks for the great recipe, Jenny. What do you freeze your tomatoes in? I worry about the freezer safe plastic bags (I know they are bpa free, but I worry about what other chemicals and endocrine disruptors we might learn that they contain in another 10 years or so. It seems like any kind of plastic isn’t really food safe in the long run, besides being bad for the earth. 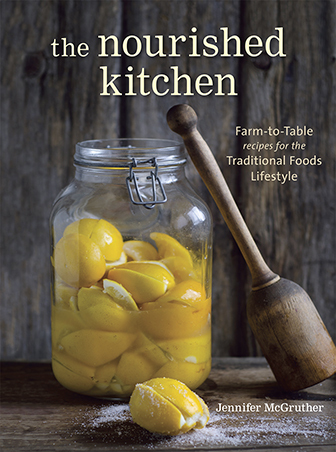 And I don’t have space in my freezers (two stand alone ones and two attached to refrigerators) to store everything in glass jars, between the space needed for local grassfed meats and all of the other local spray free fruits and organic veggies I freeze over the growing season. I’ve been freezing whole tomatoes and homemade paste and canning the purees, diced tomatoes, etc. I will try to dehydrate some next year, as well. I also have a question about homemade bone broth – try as I might, I can’t seem to get it to gel. I can’t figure out what I’m doing wrong – pastured local chickens/turkey, I let it soak in cold water and then simmer for at least 24 hours (usually longer), the juices always gel when I roast a bird in the oven, but the actual bone broth never does – although soups I make from it do usually gel afterwards. Even when I made a batch with mostly chicken feet, it still didn’t gel. Any troubleshooting would be much appreciated. Thanks again for all of your great advice and recipes!